The classic arcade fighting game, "The King of Fighters-A 2012(F)", is back on your Android devices featuring all characters you remember from the old KOF days. SNK PLAYMORE completely revamped the 2D graphics, and added even more characters to the mix! The King of Fighters-A 2012 APK is available for free download from GDrive links below the gameplay video. A Modded version is also included featuring unlimited money. Plus, you can play the game offline! 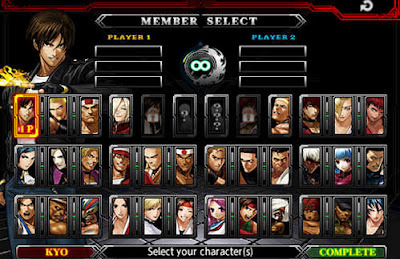 In KOF-A, players can build their favorite team from the 32 fighters available. 12 new ones have been added in this latest installment, including Kim, Ikari, and more. You just choose your fighters, head down to the arena, and start the brawling! You also get 6 intense gameplay modes. You can play in either Single or Team Battle modes, meaning 1vs1 or 3vs3 fights, to see who's the best fighter. The newly added Time Attack mode lets you compete against the clock by defeating opponents in a given period of time. In addition to other classic ones, such as Endless and Training modes. KOF-A Mod Apk version 1.0.4 fixed some bugs and crash issues on some devices for a smoother gameplay experience. Full game data has been uploaded so you can bypass Google Play download errors. For more information visit the Play Store page. Install the apk, extract Data and copy "com.snkplaymore.android010" folder to /Android/obb/ and play the game offline. A gamepad is recommended to play, as the combinations are a bit hard to perform with touch controls.